It’s the end of yet another anime season, so amidst all the final impressions, we also try to choose our favourite anime theme songs of the season. This proved rather exceptionally hard this season, as not one, but two songs were picked by two different people. I had no idea we had such unanimous taste over here. Then again, maybe we just didn’t watch enough anime this season, and that should probably tell you something. Furthermore, we have a former Supercell member sounding more Supercell than Supercell and — gasp! — heathen gaijin finding their way into the holy realm of anime music. Purge with holy flame, I tell you! I would be happy listening to Nagi Yanagi sing the phone book, so this was probably going to win for me by default. Fortunately “Tokohana” is a pretty good song to boot, with a huge chorus that could have easily come off her former band Supercell‘s cutting room floor. I haven’t watched a single episode of Black Bullet, so I can’t say I know what’s going on visually, but the animation is very pretty to look at. OK, so using an existing song is cheating a little bit, but “Walk Like An Egyptian” fits so well with Jojo‘s weird journey that it’d be unfair not to have it here. The smooth, relaxed 80s pop sound is a wonderfully kooky counterpart to the gang’s retro adventures, while David Production’s gloriously psychedelic animation flows from character to character, providing a memorable backdrop. It’s a great evocation of the retro cool of the series and a pretty funny in-joke all in one. While not as Ripple-breathingly perfect as the first two JoJo OPs, “Stand Proud” still hits all the right notes, particularly on the animation side of things. The CG is top-notch, as we’ve come to expect from JoJo, with the montage of our crew traveling the world showing off a real sense of fun and adventure. That’s not to say the music isn’t good either, with plenty of electric guitar riffs to place Stardust Crusaders firmly into the weird 80’s spot it so loves to be in. Along with being the best anime of the season, Ping Pong brought with it a really rockin’ opening. Initial fears were that the opening would only just reuse episode footage over the song, but it would appear that was just a stalling tactic until the studio was done. And it was well worth the wait. This opening brings all the energy you need to get revved up for a new episode, and brilliantly showcases the unique style of Masaaki Yuasa. The lyrics are a lot of fun and really speak to some of the central themes of the show. If anything, this show proves that there definitely isn’t only one man who can succeed at ping pong, but they’re going to try their hardest to be the one. The catchy tune and frenetic visuals really stand out and give the show that much more credibility as a classic of the noitaminA block. It’s a bit of a cop-out, I admit, but I’ll gladly take some strong use of existing music over a sloppily put together cash grab of an original tune — see also: JoJo’s Bizarre Adventure and its exquisite yet oh-so-obvious use of The Bangles. It’s simply not Mushishi without some whispery British folk no one has ever heard of, and while Lucy Rose’s poignant and understated love song may have little to do with the show, its gentle vocals and mesmerizing guitar set the show’s unique mood better than any other would ever do. Besides, it’s not like anyone’d ever be able to find a song that’s actually lyrically relevant to Mushishi. OOOOOH YEEEEEEAAAAAAAH– *ahem* When Ping Pong hit the net, we were all a little put off by the original opening, which consisted of reused footage. Luckily that changed and we got the amazing OP we have now. The lyrics and the lighthearted but intense tunes make for a wonderfully catchy opener that I stuck around to watch nearly every episode. However even more striking than the rockin’ song is the amazingly stylish visuals Yuasa and his crew cooked up for us. Shifting between different visual styles, kinetic in all the right ways, and most importantly, never a bore to watch, Ping Pong’s OP is the kind that grabs your attention immediately and lets you know that despite its seemingly mundane premise, it’s an anime that’s anything but. No Game No Life‘s art style was really damn pretty, so it was only natural for the show to get a really pretty ending to go with it. It’s neat that Madhouse opted to use the scenes of Shiro meeting Sora as an inspiration, and going with monotones before switching to vivid colors after they meet — which they also utilized during flashbacks in the show. The song “Oracion” is also great, and the way it builds from a whisper to match what is going on on the screen is a really, really nice touch. Of course, seeing Shiro make lots of cute faces doesn’t hurt at all. The way they messed with it to match what happened in episode 8 was really nice to see as well, so I am more then happy to give Madhouse my props this season. I love the symbolic nature of this opening sequence: the sunflowers blooming, with the witches waking up as the sun rises. These witches have been given the freedom to experience life for a short time. Evening falls before the title drop, signifying the end of the experience. Next, the witches gain color despite the destruction around them. This could symbolize the healing they have found despite the pain they have been through, or maybe just the forced transformation of becoming a witch itself. Following that is a demonstration of the harvest which ends with a witch melting away. It all ends with Murakami crying for them and reaching out a hand to help. It paints a beautiful picture before the show even begins. Added to that is just how catchy the music is. Sadly this minute and half of music video is a more meaningful experience than the show that follows, but I’m not here to talk about the rest of the anime. This OP was great and easily my top pick for the season. “But Chris, it’s not nearly as good as the first two openings!” Yes, and I’d probably agree with you. However, that doesn’t mean that this song isn’t good. In fact, I think it does a fantastic job at getting me pumped for each episode. The animation is really the icing on the cake, as there are some superb visuals to go along with it. You certainly hear me saying that very often when there are 3D animations involved, that’s for sure. It’s a shame that the five-man crew is spoiled, though. Did your favourite make the cut? Did we overlook a massive hit? 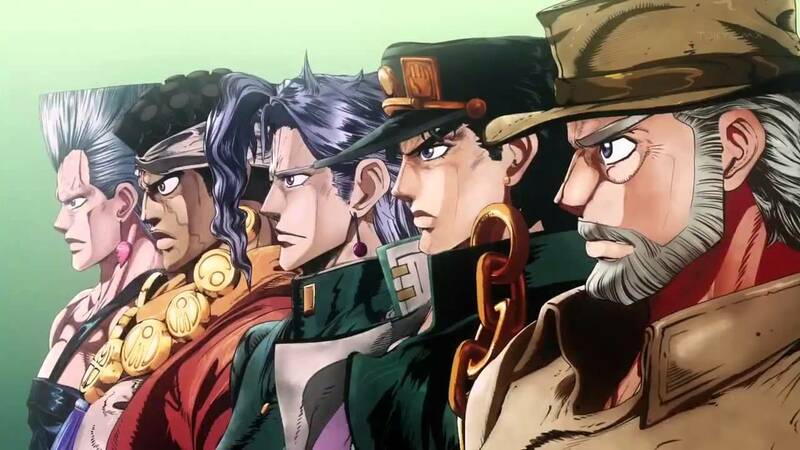 Will Jojo’s Bizarre Adventure reign supreme over this feature until the end of time? Make sure to let us know in the comments! Brynhildr in the Darkness had my favourite theme of the season. Though I did spend about 10 bucks getting Lucy Rose’s album Like I used To immediately after the end of the last episode of Mushishi. Yanagi Nagi may not have the most outstanding voice out there, and in fact, part of her appeal is probably the typical anime feeling given by her songs. The outstanding composition for Tokohana though managed to elevate her voice to something greater, like how black-metal elevates Babymetal from generic to spectacular. Third favourite for me this season. I am greatly impressed by Kayano Ai’s versatility in remaining lyrical throughout the performance of Oracion from the whisper to the chorus. I do wonder if there is an acoustic version. Neither of my favourite spring season anime OPs made the cut. *wibbles* Though admittedly, the first Captain Earth OP (Flumpool’s ‘Believer’s High’) wasn’t anything special – I just happen to really, really like that particular song. And I forgot whether you guys watched Knights of Sidonia or not, but Angela’s ‘Sidonia’ is probably my favourite single of theirs since… I’m gonna say 2003. I tend to only check out the OPs for shows that I didn’t watch when none of the shows I did watch had an OP that particularly stood out to me, but even then I would probably have accepted only one song to serve as the OP to a show called “Knights of Sidonia”. Well, I do certainly like Muse. In the context of the anime though, that’d be the wrong spelling of the word, so I’m sure I can forgive them for not using it. “Sidonia” was my second choice actually! As a guy who genuinely loves the Titan OPs, Knights of Sidonia’s was right up my alley, in all its nationalistic pomp and rousing vocals. Alas, as a huge fan of the manga, the anime has been fairly disappointing for me, whereas there are plenty of positive emotions I associate with Ping Pong’s OP. Ah, that’s a shame – it’s awful when you’re a fan of the source material and then the adaptation lets you down. I guess I definitely have the advantage on most anime there, since I’m not a manga reader as such.